Prime Minister-designate Narendra Modi has expressed his desire to 'deepen and develop' ties with Israel and his record shows he is serious. India's Prime Minister-designate Narendra Modi has expressed his desire to "deepen and develop" ties with Israel, Prime Minister Binyamin Netanyahu said Sunday, and it appears that Netanyahu's words do not constitute diplomatic flourish but, if anything, understatements. 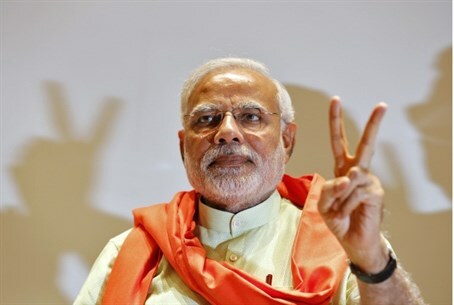 "On Friday, I spoke with the Prime Minister-elect of India. There, too, there is a clear expression of the desire to deepen and develop economic ties with the State of Israel," Netanyahu told his cabinet. The International Business Times calls Modi “Israel's best friend in South Asia,” in the headline to a weekend story about the expected intensification of India-Israel ties. Modi, the right-wing, pro-Hindu nationalist and chief of the conservative Bharatiya Janata Party (BJP), has long courted political and trade links with the state of Israel, reports IBT – and this policy, which BJP officials strongly endorse, “has turned into a financial bonanza for the western Indian province of Gujarat,” where he has served as chief minister for the past 13 years. Gujarat is a highly industrialized region of northwest India, with a population of some 60 million. Delegations from Israel and Gujarat are frequent visitors in each others' countries, and there has already been substantial economic cooperation between the two, Miller said. BJP has praised Israel repeatedly as a bulwark against Islamic terrorism. In 2003, when Ariel Sharon visited India, the Hindu nationalist Rashtriya Swayamsevak Sangh (RSS) movement stated: “The entire world acknowledges that Israel has effectively and ruthlessly countered terror in the Middle East. Since India and Israel are both fighting a war against terrorism, therefore, we should learn a lesson or two from them.” India’s and Israel’s shared role as victim of Islamic terrorism seems to be a uniting and pervasive theme in the countries relations. In addition, Israel has called for India to become a permanent member of the United Nations Security Council. India has a long history of buying military equipment from Israel; in December, India purchased 15 drones from the Jewish state, in an effort to boost security along its borders with Pakistan and China. In 2009, India bought the Phalcon tactical and surveillance system from Israel, as part of a 1.1 billion dollar deal signed between India, Russia and Israel in January 2004. Israel's military industry firm also announced plans at the time to establish five factories in India for the production of artillery shells. A poll conducted in 2009 by Israel's Foreign Ministry found that the people of India are Israel's “best friends.” The poll surveyed 5,215 people from 13 countries described as “central” ones, and found that 58 percent of Indians support Israel. In second place, 56 percent of U.S. citizens expressed support for Israel, as did 52 percent of Russians, 50 percent of Mexicans, 48 percent of Chinese and 39 percent of Italians.